As sports fans around the world get ready for the official opening of the 2016 Rio Olympics, Canon’s Professional Services team are preparing too. We spoke to Elizabeth Pratt, Director of Professional Products Marketing at Canon Professional Services about how Canon is preparing for the biggest event in the sporting calendar. The first shift of CPS staff, starting at 7:30AM, pauses to pose for a group photo. What exactly are you doing in Rio right now? I’m down here with Canon Professional Services, and there are also some folks here from our broadcast team. CPS provides event support for all kinds of things, any time a lot of media gathers — events like the Super Bowl, the Indy 500, the Kentucky Derby, the political conventions that we recently attended. These are very important assignments for photographers and we want to be on-site to ensure everything goes smoothly. 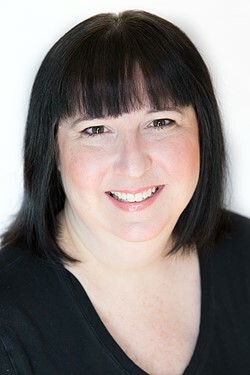 Elizabeth Pratt, Director of Professional Products Marketing at Canon Professional Services. We offer cleaning and checks on equipment to make sure that everything is working at factory spec. Also in situations like this, for someone shooting with an older model camera we like to give them the opportunity to shoot with the latest equipment. And then of course photographers also have a need for remote cameras, but not everybody takes six cameras to an event so they can use four of them as remotes. So we loan additional cameras to help them out. With over 70 Canon staff supporting photographers and broadcasters, coordinating schedules is no easy task. How long does it take to plan your presence at an event as big as the Olympics? We started planning at least a year ago, just trying to determine how much equipment we were going to need to be able to support all of our customers, how we were going to get it all into and out of the country, through customs… It’s a collaboration between the home country, the CPS folks who are based in Rio, Canon USA is supporting with a lot of equipment, Canon Europe is contributing to the equipment as well, and we’re all sending staff. So the planning really starts at least a year in advance. Racks of lenses and professional Canon DSLRs, ready to be distributed to photographers at the 2016 Olympics in Rio. Can you give us an idea of exactly how much equipment you’re sending? 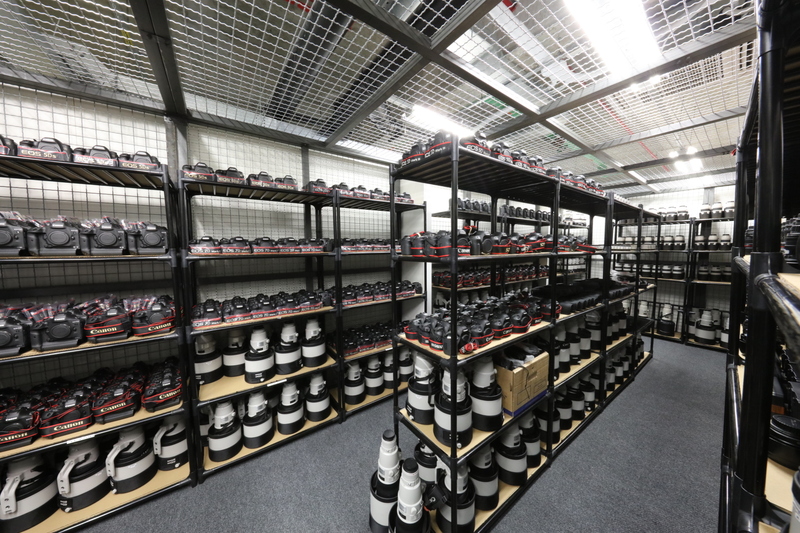 Almost 1600 lenses and about 900 DSLR bodies. That’s EOS 7D II, EOS-1D X II and EOS 5DS cameras. We also have 78 staff. We have what we call our Professional Market Specialists, whose job is to support professional photographers and filmmakers by answering questions and giving people advice and support. In addition to these people we have logistics folks on site, and then actual technicians who are working on the cameras. At most events we just do cleaning and checks, but here in Rio we have virtually a complete repair center set up where we’re doing much more extensive repairs than we normally do on-site. How many languages do you have represented among your staff over there? 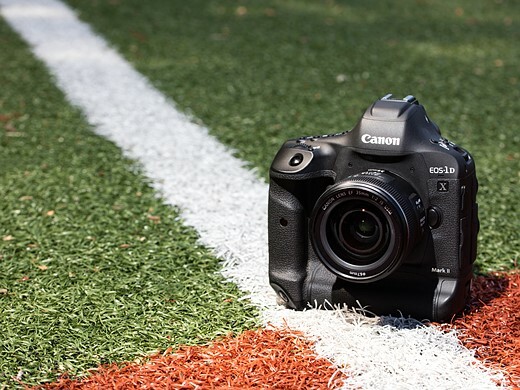 The EOS-1D X II is a capable video camera, as well as being designed to capture fast sequences of still images. Are you supporting any photographers in Rio who are using the EOS-1D X II for video, or for broadcast? There are plenty of people shooting video – not necessarily for broadcast, but certainly several independent agencies and teams. Our big clients like Getty and AP are incorporating video more and more. We talk about video a lot to photographers and they’re being asked to shoot more video and to learn about video. We’re starting to see newspapers and publications even merge departments and cross-train people [for stills and video]. 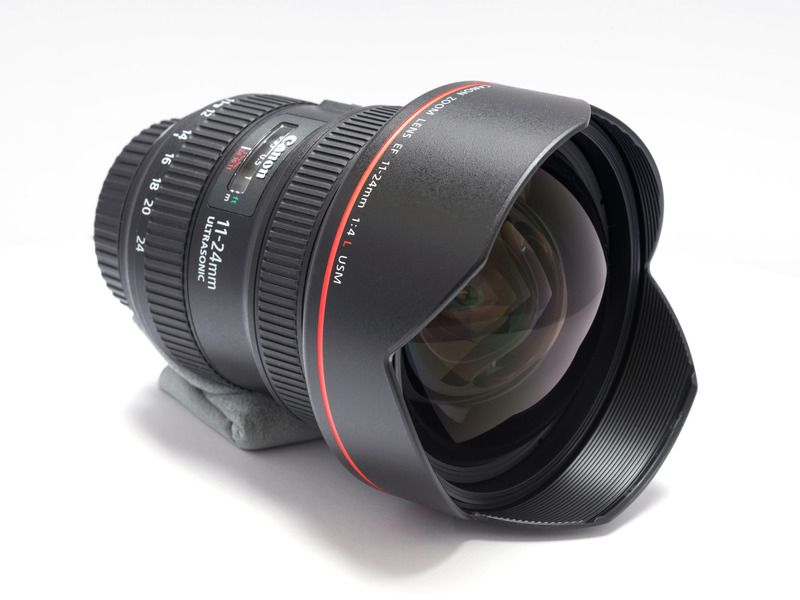 Canon has partnered with Getty to create a submersible remote camera setup using the EOS-1D X II and the company’s 11-24mm wide-angle zoom, specifically to shoot underwater events at the Olympics. How closely do you work with agency clients ahead of big events like this? 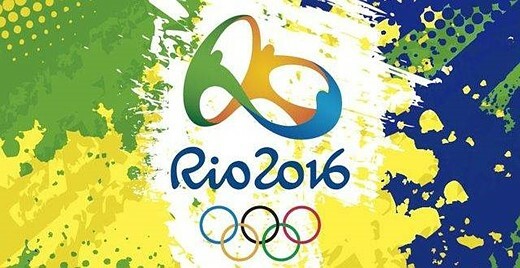 We’ve worked very closely with the big agencies in preparation for the Olympics. We have some robotic cameras down here and we worked with the agencies to develop them for their needs. These robotic solutions are amazing. You can shoot remotely on them from the press center with multiple remote cameras attached to one computer, and switch back and forth. It allows perspectives on the Olympics that we’ve never seen before. We’ve been helping to support an underwater system, which was developed by Getty. It’s an EOS-1D X Mark II and 11-24mm lens. The camera is in an underwater housing, and it’s networked so that it can be controlled remotely. The flexibility of control is exceptional, and the 11-24mm has really nice distortion correction — you don’t have the kind of distortion at the frame edges that you might get with other wide-angle lenses. 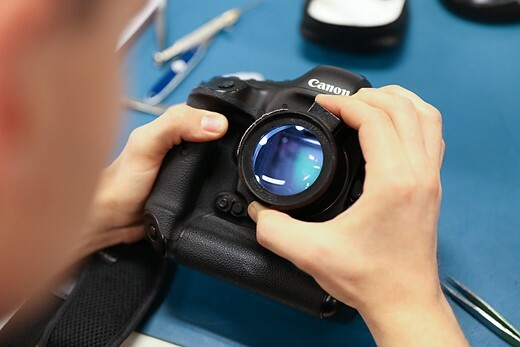 A Canon technician uses an illuminated loupe to check for dust on the sensor of an EOS-1D X II. How many of this sort of major events have you personally been involved in? I started off as a professional market specialist with Canon and my first Olympics was Athens in 2004. We’re much more collaborative now in the way that we work with clients. We reach out to them well in advance and talk to them about their workflow and how their needs are changing. Then we customize solutions to meet those needs. When I started with Canon years ago, we just made cameras and said ‘here you go’. Our whole mindset has really changed, to try and figure out how to change and adapt as the industry changes. How will the next Olympics in 2020 be different? I think we’re at a very interesting place now with technology, with the integration of 4K into DSLRs and the ability to grab incredibly high resolution, beautiful frames from that video. I think there’s potential to change the way that photographers work. I don’t want to try to predict the future but I think that’s probably going to be one of the biggest factors that influences what’s going to change and what new equipment will bring in the next four years.